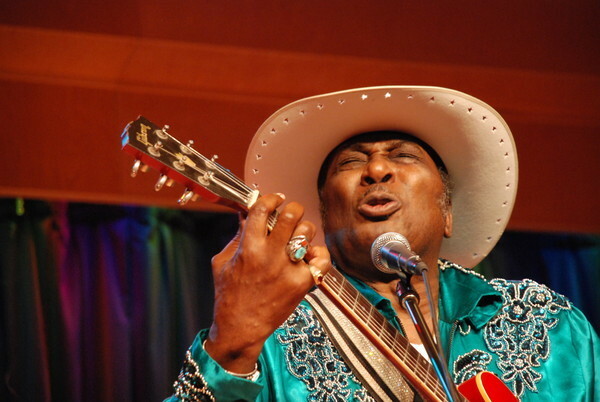 Last Sunday, Eddy Clearwater lived up to the expectation once more, as he turned the small crowd at the Skokie Theatre into a boisterous rhythm and blues revelry. The rare Skokie performance by the Chicago blues legend is part of an ongoing community effort to save the storied theater from possible bank takeover. Just two weeks from now his busy schedule will bring him to Dunkerque, France, and on to the Netherlands in November. With his every distinct Chicago riff and his husky voice, the Mississippi native injected just the right kind of musical dose into his impassioned plea. From the outset, Clearwater already pumped up the gathering. 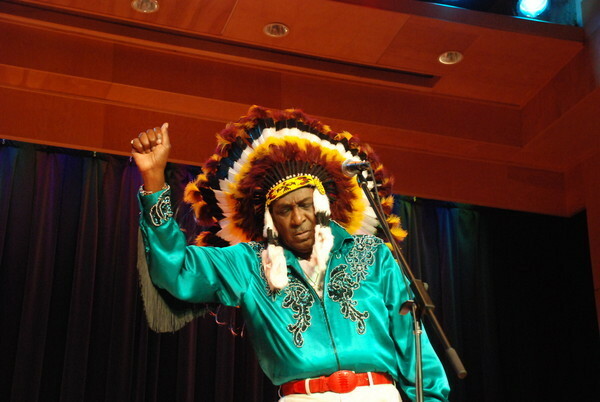 Wearing his signature Cherokee headdress, “The Chief” — a name he earned for his stature in the R&B community and his Native American heritage — stirred the audience with his funky harmonics. His intonations of “Sweet Little Rock-N-Roller” and “Midnight Grove” were as bold as his emerald blue-green shirt, red Alligator belt, cargo pants and white cowboy boots. Jamming with Clearwater was his band, the trio of Shoji Naito on bass and harmonica, Tom Crivellone on guitar and Merle Perkins on drums. Performing the front act was Albert Bayshore, a Florida-based blues artist who will be launching his first solo album in the next few months. The Sunday night benefit concert is raising hopes that the theater will eventually be saved. 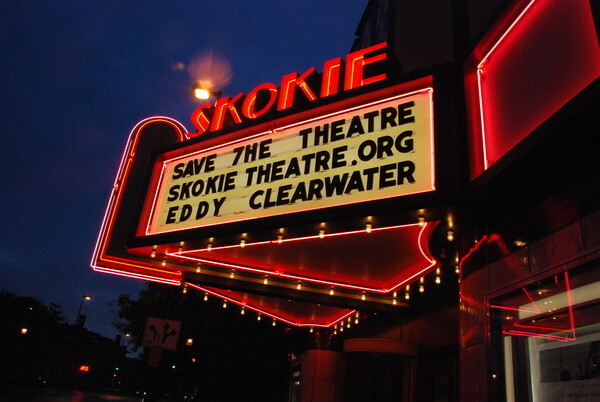 Currently, the Skokie Theatre is in receivership, a step before foreclosure. The Federal Deposit Insurance Corp. (FDIC) appointed Red Seal Homes of Northbrook as its receiver, which will then determine the theater’s future. The 120-seat theater, under the Skokie Theatre Music Foundation, originally took $1.2 million in mortgage loan from Town Community Bank and Trust of Antioch for repair. The bank, however, was closed and taken over by FDIC. According to Allan Curtis, the theater’s operations manager, the foundation will learn its fate by Oct. 1. At a related cookout and fund-raiser before the performance, Curtis put his pitch to save the theater on practical terms. “I think this is a very important place for downtown Skokie,” Curtis said of the nearly century-old landmark. He said that by staying open, it could help spur business activity in Skokie. Curtis said any donation is welcome. “The important part is that people stand up and want to be counted. If they want to get counted, then we would get the support we need to make this happen,” he said. Randy Miles, president of the Independent Merchants of Downtown Skokie, added: “We all know how desperate the theater is in need of some funds to try to buy it out of receivership. “We’re trying to come together as a business community to help to do what we can to help raise money,” said Miles, who helped the theater book Clearwater, a personal friend. “[Clearwater] wants to give back to the community and he said I’ll be there,” Miles added. Miles said donations are coming in. One of those who lent support, and did some political campaigning, was Hamilton Chang, a candidate for the state representative seat in the 17th District. The non-profit North Suburban Business Development Foundation of the Skokie Chamber of Commerce accepts contributions for the Skokie Theatre. To donate, click here. To read more on the Skokie Theatre’s situation, click here. Other fund-raising events are also lined up for the upcoming months. Students from Columbia College will hold the Northshore Short Film Festival on Sept. 26 and Charlene Brooks will do a Barbra Streisand benefit performance Oct. 2. All proceeds will be donated to help save the theater. For a full schedule of shows, visit www.skokietheatre.org.